Where do we go from here? This, as I see it, is the question for contemporary extreme metal. For my money, Goya provided the best answer when he wrote that “fantasy abandoned by reason produces impossible monsters: United with her, she is the mother of the arts and the origin of their marvels” in a caption for an etching. The creative drive doesn’t need to be restrained by traditions, as it can take advantage of them and produce greatness a la Sulphur Aeon. This is difficult, so there are two other common answers: 1) play music that’s a carbon copy of the classics in every aspect but quality, and 2) pretend genre traditions are restrictive fetters and create “genreless” twaddle, avant-gard arbitrariness, and post-everything nonsense. 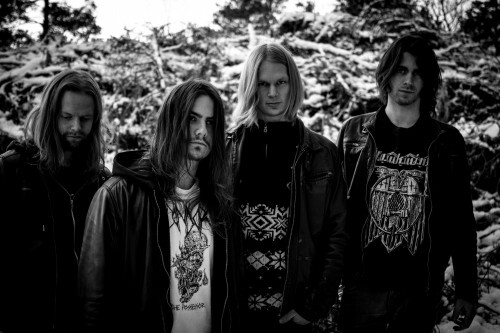 Upon learning that Norwegian newcomers Reptilian were peddling a “unique and twisted form of Death Metal” on their debut Perennial Void Traverse, I gritted my teeth and prepared for the boring hipster “soundscape” that was to greet my ears when I hit play. 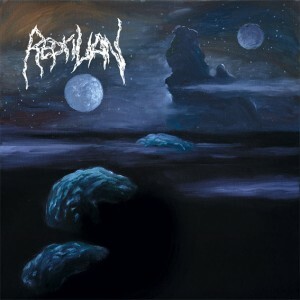 Luckily for me and people who like death metal, Reptilian isn’t unique whatsoever in the gluten-free post-whatever sense. At first blush, they actually sound quite a bit like fellow Norsk death merchants Obliteration, but this is far from a boring rehash of Black Death Horizon. Perennial Void Traverse finds its roots firmly in Autopsy, particularly Mental Funeral, as well as early Swe-death, particularly Entombed‘s Left Hand Path. While it does sound a bit demented and has an Aztec theme lyrically, nothing here is twisted enough to give Mental Funeral’s lightning-in-a-bottle lunacy a run for its money. Once you get past the wonderfully feral van Drunen and Steeve-Hurdle-isms of C.B.’s vocal performance, this is all largely normal genre fare, and apart from the press release, has no pretensions of being anything else. That’s not to say Reptilian is bad, boring, or incompetent. They’re quite good at their chosen sound, especially when they draw more heavily on the sounds and ideas of their legendary forbears. “Cadaverous Creature” is entertaining Autopsy worship occasionally borrowing early Entombed’s riffs and techniques to spice things up, with D.T.’s almost unhinged Reifert-style drum performance being a particular highlight. “Possessed by the Eyes of the Living God” follows the Autopsy push-pull tempo dynamic to a tee, infusing some chugging reminiscent of early Asphyx into parts of the bridge successfully, remaining both punishing and engaging all the way through. The speedy Swe-death outburst in “Cede to Celestial Providence” is effective because it substitutes Entombed’s tremolo in the lead with Autopsy’s longer, droning melodic lead style, showing Reptilian working smartly with their decades-old building blocks. Much like Autopsy’s best work, Perennial Void Traverse aims to drag the listener down into the filthiest swamps with its grimy, jarring, and violent music. They get this right most of the time, but falter when they make arbitrary songwriting decisions that experience and/or beginner’s luck would’ve avoided. The attempt to subtly ape Portal for thirty seconds straight with “spooky” tremolo in “Phantasm” is a very noticeable example of this, as is ending that same song with almost ninety seconds of feedback. “Swamp” builds up tension with Autopsy death-doom before launching into a typically Swedish full-steam-ahead charge, but after the satisfyingly jarring transition it doesn’t know what to do with itself. So it thrashes away nicely enough, throws in a solo, and then ends…or rather, it should have. Instead, a gratuitous Autopsy death-doom bit is thrown in after what would have been a brief and effective feedback-laden conclusion for no good reason. Nonetheless, Reptilian is a band to watch out for. They’ve got raw talent, which is especially obvious in D.T.’s excellent drum work and C.B.’s savage vocals. They picked the right production by using one that sounds like old Autopsy, and it was a refreshing joy to listen to. The drums are accentuated wonderfully, that great Mental Funeral bass sound is kept alive, and the guitars are at once clear and filthy. I find myself of two minds about Perennial Void Traverse. On the one hand, it has myriad quality moments of old, rancid, Swedish Autopsy worship. On the other, the quality doesn’t match that of their main influences and there are some questionable songwriting decisions. At the end of the day, I like to see the best in the music I’m given, so I’ll leave you with this: Reptilian isn’t perfect, but their successes far outweigh their failures. Their hybrid of early Entombed and Autopsy left me mostly satisfied, and if they hone the little details their sophomore record will be a fearsome creature from the most putrid and noxious swamps. Until then, this is good stuff and I’d recommend hearing it at least once.